Alas, there was no conspiracy. 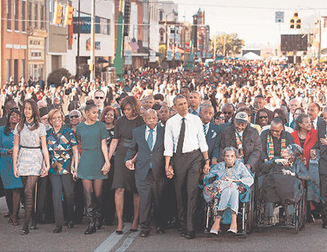 Unfortunately for Republicans, The New York Times did not crop George W. Bush out of an amazing A1 photo that featured President Obama participating in a commemorative march in Selma, Alabama. Bush was indeed left out of the photo, but not because he was a terrible president who plunged the nation into a senseless war which eventually fueled the creation of ISIS, because including him would’ve made it a bad image. Just so you know … at the time the photo was taken, I was using a 70-200 long zoom lens. I also had a remote camera with a wide-angle lens attached to the side of the truck that took a photo at the just about the exact moment as the tighter one. As you can see, Bush was in the bright sunlight. I did not even send this frame because it’s very wide and super busy and Bush is super-overexposed because he was in the sun and Obama and the others are in the shade. There you have it. Hopefully this settles the matter for good. Unless… Is Mills a registered Democrat??? ?